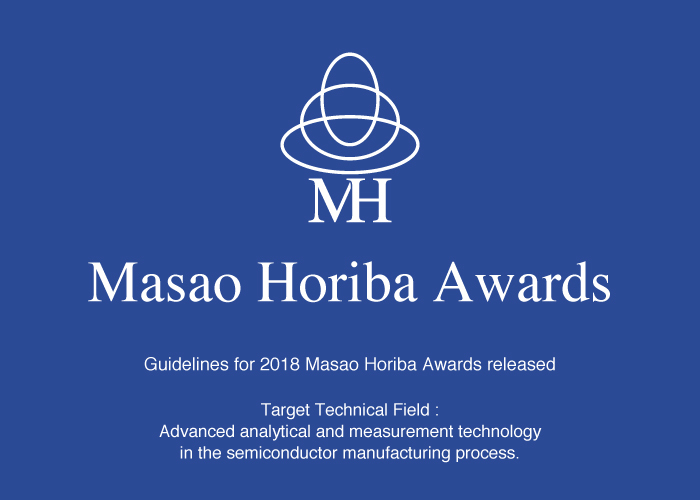 HORIBA, Ltd. announces the winners for the 2018 Masao Horiba Award, a research incentive award for analytical and measurement technologies, targeting researchers and developers from universities and public research institutes in and outside of Japan. The theme for this year, which marks the 15th anniversary of the award since its inauguration in 2003, was: “Advanced analytical and measurement technology in the semiconductor manufacturing process.” We sought applicants from March through May this year and received 36 applications, including some from abroad. A panel of eight reviewers, consisting of experts in the field of application, evaluated the applications with a focus on potential, inventiveness, and the possibility of development into a unique measuring instrument, and selected three Masao Horiba Award winners and one honorable mention. The commemorative seminar and award ceremony will be held at Shiran Kaikan, Kyoto University on October 17 (Wednesday), inviting attendees from the academic and administrative sectors. The first industrial revolution came with the invention of the steam engine. The second came about due to mass production through electricity and oil. Next, the third was characterized by computer automation. Now, a fourth revolution, one of IoT (internet of things) and AI has begun. Semiconductors are increasingly important as the foundation of these kinds of major reforms to industrial structures, and there is great demand for process technology that will miniaturize as well as improve performance and reliability for the next generation of semiconductor devices. This year’s Masao Horiba Awards shines a spotlight on research and development leading to the creation of new value through analytical and measurement technology that advances the film formation and etching processes. These processes are of particular importance in the semiconductor device manufacturing processes, which, in turn, are indispensable to industrial development. Plasmas*1 are ionized*2 gases composed of electrons, ions and neutral particles. Plasmas generated in low-pressure gases with a thermal non-equilibrium feature have been widely utilized in semiconductor fabrication processes. Among various parameters and particles in the plasmas, electron density is crucial to understand their physical and chemical characteristics. Laser interferometry*3 is a method to measure the electron density inside the plasmas. However, considering its application to advanced plasma processes, conventional interferometry arrangement has difficulties in spatiotemporal resolution and sensitivity of the electron density. Dr. Urabe has proposed and experimentally verified his idea of interferometry techniques, such as combination with millimeter wave transmission*4 and near-infrared diode laser interferometry, in order to overcome the difficulties of the existing laser interferometry. In near future, it is expected that the developed laser interferometry will be integrated with semiconductor process equipment for continuous electron-density monitoring and fault detection. That can contribute to precise process optimization and yield improvement in the semiconductor fabrication processes. *2 Ionization: The transition of atom or molecule from electrically neutral mode to positively or negatively charged mode, which is called positive or negative “ion”. *3 The apparatus for material examination by analyzing interference pattern generated by two or more laser beams originating from the same source where reference beam and object beam are interfering. *4 A method of optical absorption spectroscopy irradiating a millimeter wave to plasma and measuring the absorption. It is important to accurately measure and control the temperature of wafer in order to realize the reproducibility of the semiconductor devices at the atomic level. Even though it is necessary in the semiconductor manufacturing process, an accurate measurement of the wafer temperature, performed using an optical interferometer*, has been extremely challenging due to various disturbances from others devices, such as vibrations. Having focused on a high degree of parallelism and high reflection of the wafer, Dr. Tsutsumi has proposed a novel approach to measure the temperature of wafers using the interference of lights reflected on front and back surfaces of the sample. His method, unlike the conventional one, uses a single path to drive the interfering light to the detector. His apparatus can consequently perform highly accurate temperature measurements with a strong robustness against vibrations. This technique enables high-accurate and high-speed temperature monitoring of the wafer during the process. Thus, the great contribution for improving the yield of manufacturing processes can be expected. * When a light beam is split from a single source and recombined hereafter, a phenomenon called “interference” occurs. The interfering light includes information such as the refractive index of a material or the length of the path that divided lights through. In semiconductor device fabrication, plasma processing technology is widely used for deposition/removal of thin-film materials on/from the wafer. The device performance is strongly influenced by the electronic properties of the films, so that it is necessary to precisely control the plasma processing to achieve high performance of devices. However, the impact of plasma processing on electronic properties of the films has not been elucidated. Dr. Nunomura has developed a technique for detecting electronic defects during plasma processing, by measuring the photocurrent* in the film under illumination of light at two different wavelengths. Using this in-situ real-time technique, he has successively demonstrated the generation and annihilation of electronic defects during the fabrication process. Although his research work is oriented towards the deposition process of amorphous silicon films for solar cells, it can also be applied to processes using other plasmas. * Photocurrent is the electronic current in the semiconductor materials, excited by illumination of light. The illumination of light generates free electron-hole pairs in semiconductors. Plasma characterization and control play a crucial role in semiconductor manufacturing and processing. In industrial environments it is very important but also challenging to obtain information on the plasma, e.g., types of ions, their density and flux etc., without disturbing it. Mass spectrometry is a non-invasive diagnostic method that can easily be applied under processing conditions. However, so far the diagnostic could deliver information only on the ionic parameters at the surface where the spectrometer is installed. Dr. Tsankov has proposed a novel idea for analyzing the ion velocity distribution function measured with an energy-resolved mass spectrometer. The idea is based on a solution of the Boltzmann equation* and allows multitude of plasma characteristics to be obtained not only at the surface but also in the volume of the plasma. Such a diagnostic method is extremely valuable for the semiconductor processing since it is inherently non-invasive. It is expected that the technique will provide a simple means for processing control and an easy way of plasma characterization. * An equation determining the velocity distribution of the particles.